By the time Wednesday rolls around, I’m usually thinking seriously about my weekend breakfast options. Geez, that sounds pretty lame, but I eat granola and yogurt every morning during the workweek, so I’m more than ready for a switch-up by the time Saturday arrives. Usually I’ll go with pancakes over French toast, but last weekend I couldn’t resist the photo of “French toast sandwiches” in a great breakfast cookbook I have. This is a lot like stuffed French toast, except here you just sandwich together two slices of bread (I used homemade brioche that I had in the freezer) rather than making surgical-style incisions and injections into one fat slice. The filling is just a schmear of soft cream cheese and your favorite jam. I think a marmalade or a tart jam works best…I used my homemade plum jam here…especially if you plan to slosh it with maple syrup. -In a large shallow bowl, whisk together the eggs, milk, orange zest, orange juice and vanilla. Lay one bread slice on a work surface and spread with one-fourth each of the cream cheese and jam. Top with another bread slice. Repeat with the remaining bread, cream cheese and jam. -Preheat a griddle over medium-high heat until hot. Lightly oil the griddle. -One at a time, dip the sandwiches into the egg mixture and turn gently to coat evenly, keeping the sandwiches intact. Let stand until the bread has soaked up some of the egg mixture, about 30 seconds. -Remove the sandwiches from the egg mixture, letting the excess drip back into the bowl, and place on the hot griddle. Cook until golden brown underneath, about 2 minutes. Turn the sandwiches over and cook until browned on the other sides, about 2 minutes more. Transfer to a rimmed baking sheet. -When all four sandwiches are on the sheet, place the sheet in the oven and bake until the cream cheese melts, about 10 minutes. 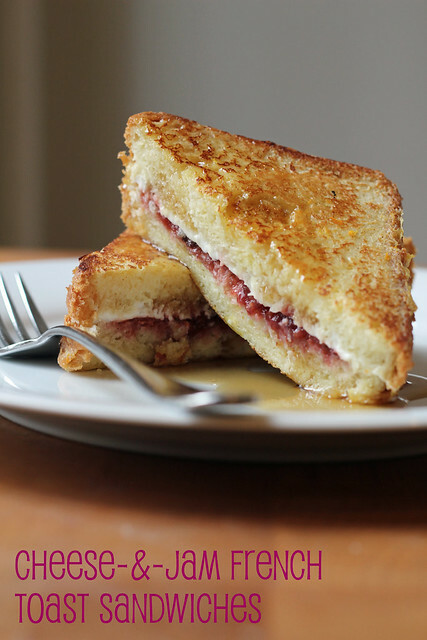 -Serve the French toast sandwiches immediately with butter and maple syrup. Looks like the perfect weekend breakfast! Yum!! Oh I will so be making this. Thanks for posting it. I don’t think anything could be better for French toast than brioche. Looks delicious!!! Lying in bed thinking how lovely this would be for breakfast. Another day perhaps as I’ve only got brown bread 😦 not quite the same. I would have never come up with this flavor combination on my own but I have to say – it looks sinfully delicious. I can’t wait for the weekend to try this! This is the first look I’ve had at your blog. Look forward to what else you have to offer..